1. On November 28th, 1995, President Bill Clinton ended the 55 MPH nationwide speed limit that began in 1974 as an energy saving measure during the Mid-East oil embargo. If you are old enough to remember this (I sure am) did it make you happy? Do you have a heavy foot when driving or does 55 MPH sound good to you? I do not remember feeling anything about it, I was probably clueless as I did not watch much tv at that time to learn about it. I am however happy about it and yes I have a heavy foot. 2. You are home alone on a rainy/snowy Sunday afternoon. What Christmas movie will you watch? I enjoy watching the Hallmark Christmas movies. Here is a picture of one of my dogs...this is Mandy. 3. What is something you have tried that you will never try again? If I have tried something I do not like...and I am sure I have, I must had put it out of my memory. If I think of anything, I will change my answer. It would be something that frightened me probably. 4. Today is National French Toast Day!! Will you have some? Do you like French Toast? I love French Toast, but I will be at work and unable to prepare anything. 5. The Christmas Tree in Rockefeller Center will be lighted today, as will the one at the White House in Washington, D.C. Do you have your tree up and is it lighted? Have you ever been in New York City or Washington, D.C. to see the trees all lit up during the holidays? My tree went up last weekend. I have been to Silver Dollar City at Christmas, but not Washington D.C. or New York City. 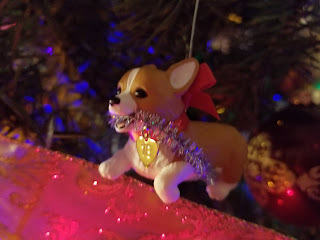 Here is a picture of my corgi Christmas ornament from Hallmark. 6. Tell us something random about this week of yours. We are having pajama day at school today, I honestly do not love pajama day. I love to wear pajamas at home, but not so much when I am working. I'm going to tell you my Corgi story quickly. I have dachshunds and a white shepherd. We went in our camper to see friends who had 5 Corgis. The corgis immediately adopted our dachshund, but would not allow the shepherd to play in the group. Somehow they figured a long, low dog, however, strange looking, must be one of them. But not that big shepherd! Still makes me laugh! I wish we had pajama day at work!!! I miss that day so very much! HA! Have a great one and enjoy comfort ALL DAY! Ahhh... a pajama day!! I would want to stay home in them, though, so I agree with you! Thanks so much for joining in today! Your sweet doggie is adorable...love the Christmas lights! 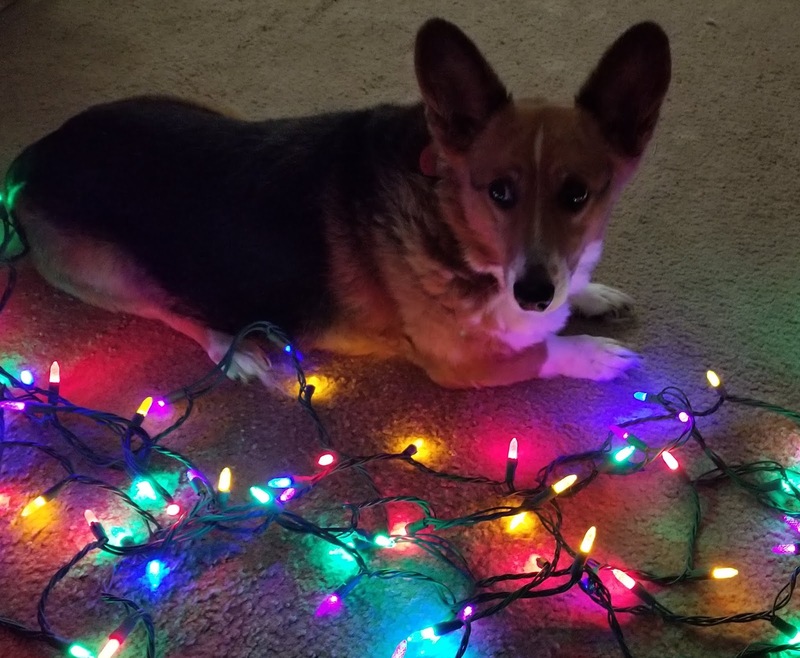 Our daughter and her family raise and breed Welch Pembroke Corgi's. They have 4 liters a year. They have flown them all over the country to folks that have bought them. Unreal! And, my daughter would agree with you on Pajama Day. She hates them because she doesn't want to wear PJ's to work. I love the Hallmark Christmas movies too. 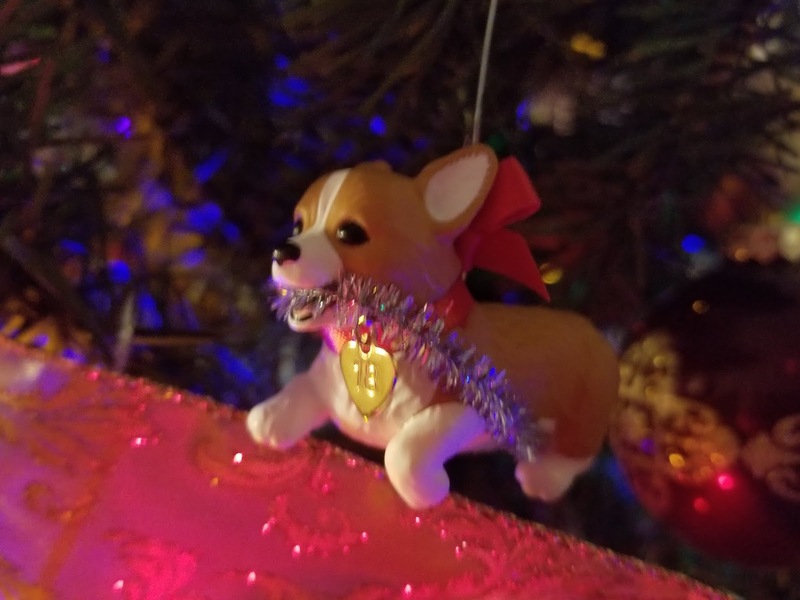 Your dog is a cutie and so is the ornament. Oh, I think I would love pajama day at work. When I get home if I am not going anywhere else I change into my pj's as soon as I can now that the weather is cold. My kids have the pajama day soon and for me, I'd think it would make me feel like it's time to sleep - or at least lay in my chair with a blanket!